I meant to post about this before. Back in January the Huffington Post used one of my photos in an article on Puff Pastry. Fry eggplant in butter and olive oil until golden. Set aside. Roll out puff pastry 1/8 inch. Cut into four squares. Place on parchment lined baking sheet. Brush edges of pastry squares with beaten egg. 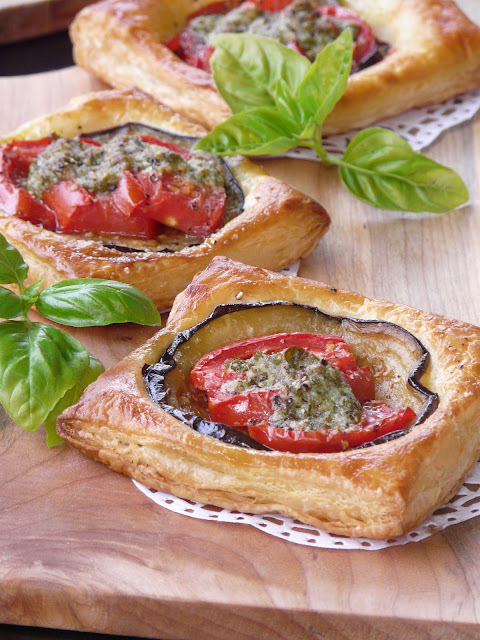 Place one slice of eggplant in centre, top with two to three slices of tomato and a dollop of pesto sauce. Sprinkle with salt and pepper. Bake about 15 minutes or until pastry is golden. That is wonderful and well deserved:-) Bravo Ann! Well deserved, and it looks beautiful! Gorgeous Ann...and of course very well deserved!